Another common genus is Thelymitra, which has such regular flowers that the common form is often called Native Hyacinth. This is a handsome plant, sometimes 2 feet high, with numerous rather large flowers, blue, pink, yellow, or white, often spotted. All six segments of the perianth are about equal, and spreading. 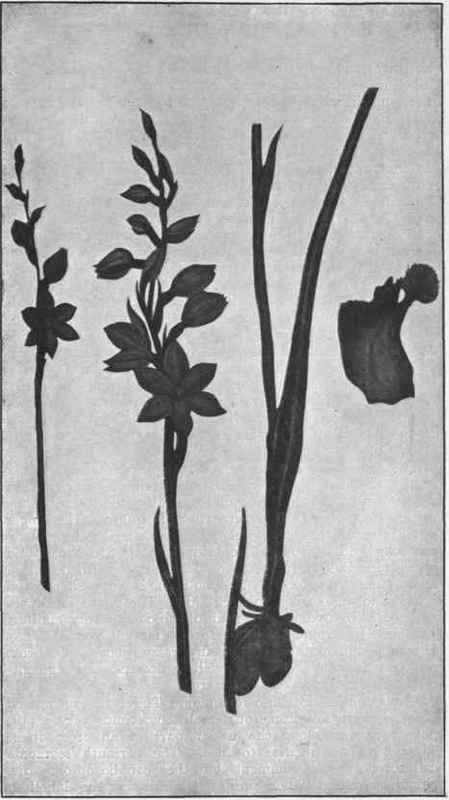 The column is short, with the nectary, stigma, and anthers close above one another. 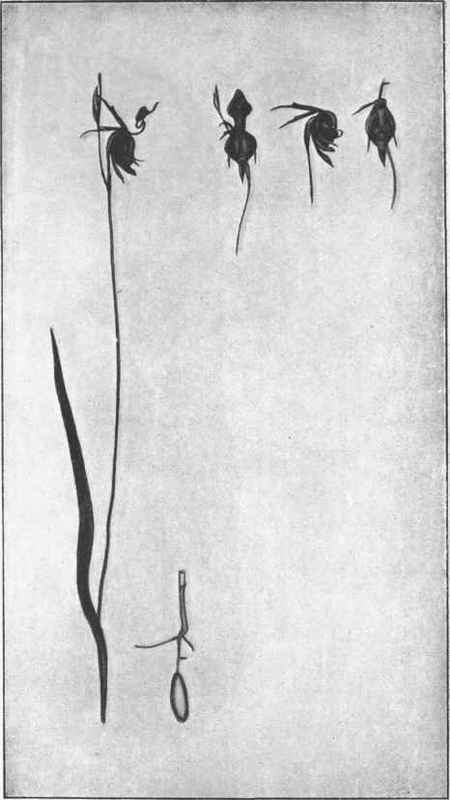 It has a wing running down each side, at the upper end of which arises a lobe terminating in a brush, club, or other adornment, according to species. Parson-in-the-Pulpit is a pretty little spring flower. It has a solitary or sometimes two blooms on a slender stalk, of a pretty mauve or paler shade, about an inch across. Three sepals and two petals are similar and spreading. The labellum is short and convex, and from its base there is a little erect, usually yellow, lobe, which gives its name to the flower. The column is the same in structure as in Caladenia. The Tigers are common in spring and summer. They are yellow, generally blotched with reddish-brown. The flowers are fairly large, and generally there are many on an erect stem. They are very irregular. The upper sepal is broad, and over-arches the column; the lower ones are long and narrow. The lateral petals are broad and spreading; the third petal or labellum is broad, rather short, and three-lobed. The column is very short, and bears a lobelike wing on each side. 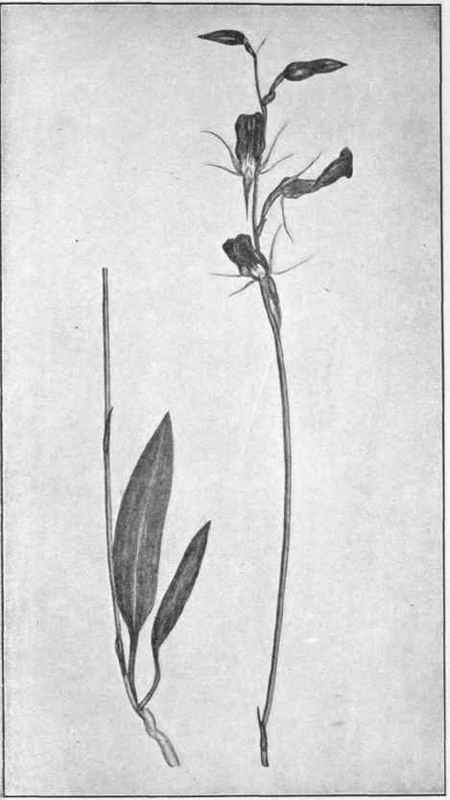 The genus is Diuris, and we have five species, four of which are very similar, but the fifth would be taken for a different genus. It is Diuris pedunculata, common in grassy woods. It bears one to three pale or orange-yellow flowers, the segments of which are all directed forwards. Fly Orchids are also common. They are so named because there are numerous small, sometimes very small, flowers massed along the upper part of an erect stem. They have no likeness to flies. 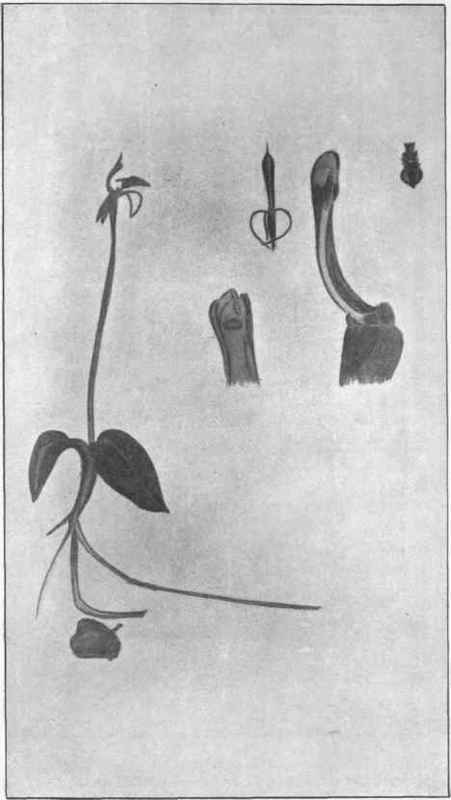 The perianth segments call for no special comment, but they can be at once distinguished from other similar Orchids by the labelium being above and the column below. 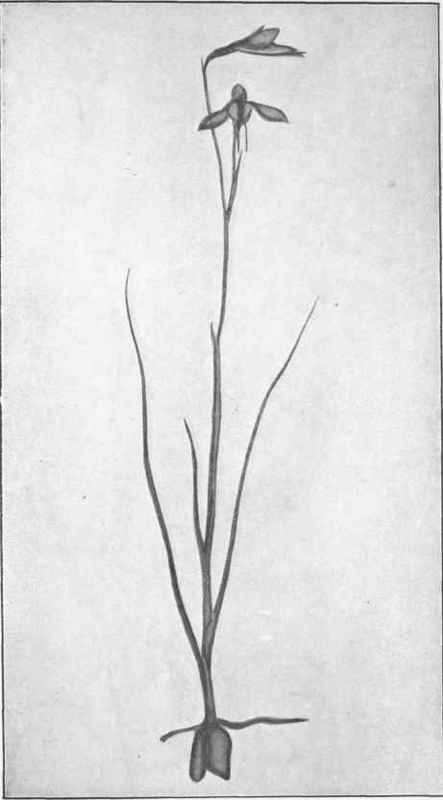 This is the normal position, and in those Orchids where the other condition is present it is brought about by a twisting of the flower-stalk. We have twelve species, and the colour is commonly red-brown or greenish marked with white. The column is very short. Microtis has green flowers, and looks very like the last, only the flower has the labellum below. Spiranthes, hitherto only found on the east and north coasts, has numerous small pink flowers arranged in a spiral. Cockatoo is widely dispersed, though seldom gathered. It is dark red-brown throughout. 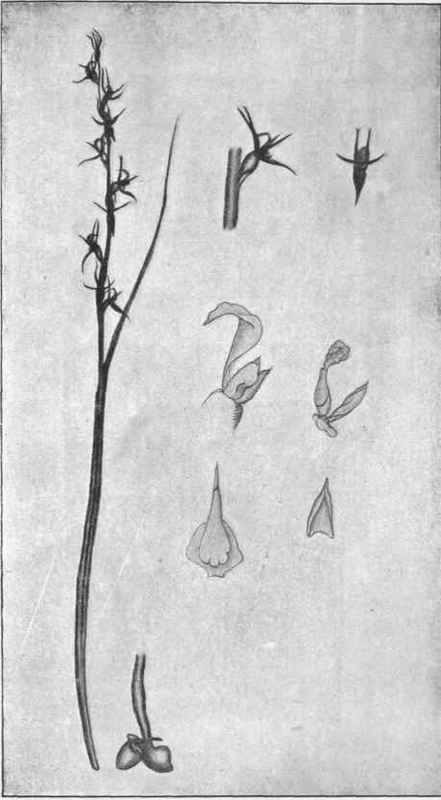 The stalk is slender, erect, and bears one to three medium-sized flowers. The sepals and pair of petals are all narrow and slender. 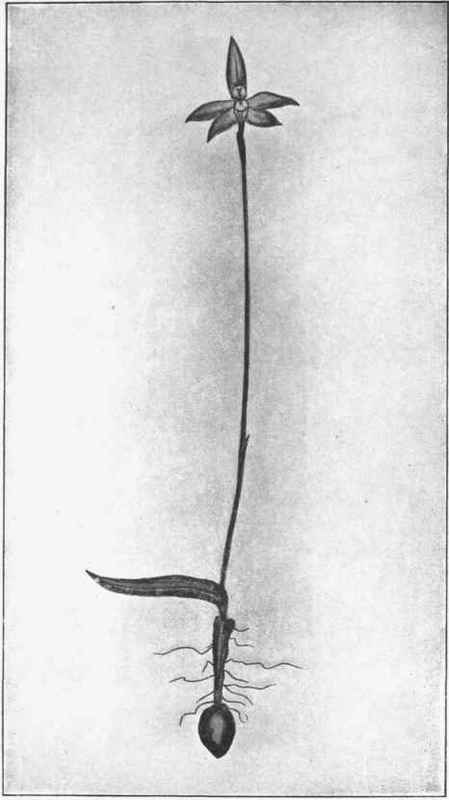 The column is below, nearly as long as the sepals, curved and bordered by two large delicate, somewhat diverging wings. 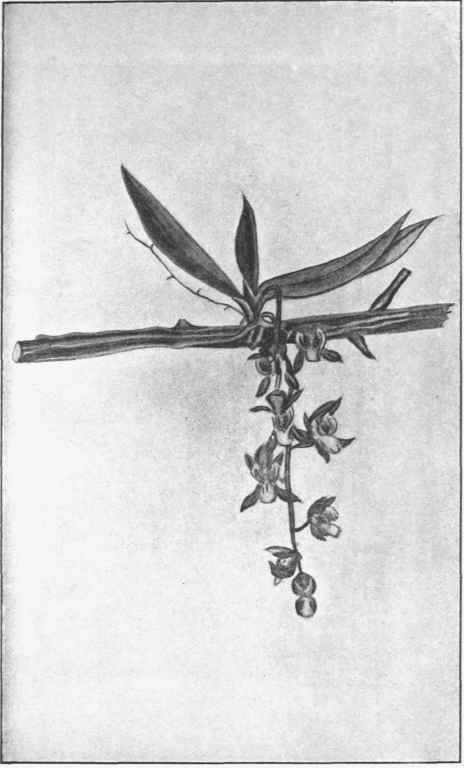 The labellum is above; it has a strap-shaped, irritable stalk, and a broad convex, nearly black, main portion that appears as an inviting crest for a fly to alight upon. When a fly does so the labellum suddenly shuts down, enclosing it in a box composed of the labellum and column wings. The insect, in its efforts to escape, rubs itself on the stigma and then against the anthers, performing similar work to that done in Cow Horns. Duck Orchid is occasionally found in swampy country. The flowers are dark-red. With a very small column, it has a very large broad labellum, which is above, and looks something like a duck's bill. As already said, the common habit of tropical Orchids is to grow upon the branches of trees. They are not parasites, but simply epiphytal; that is, grows upon the tree without deriving nourishment from it. We have only one epiphytal Orchid, which is occasion ally found on the east and north coasts. It has many long roots, closely clasping a branch, a few long flat pale-green leaves, and drooping bunches of pink and white flowers. It is commonly called Gunnia, after R. Gunn, the man who did more than any other Tasmanian botanist in the study of our plants. Of our other Orchids, Ant Orchid has a pair of broad leaves close to the ground, and an irritable labellum with shining glands on its surface, giving it a resemblance to an ant. Longbeard has a long labellum placed above and densely covered with purple hairs. 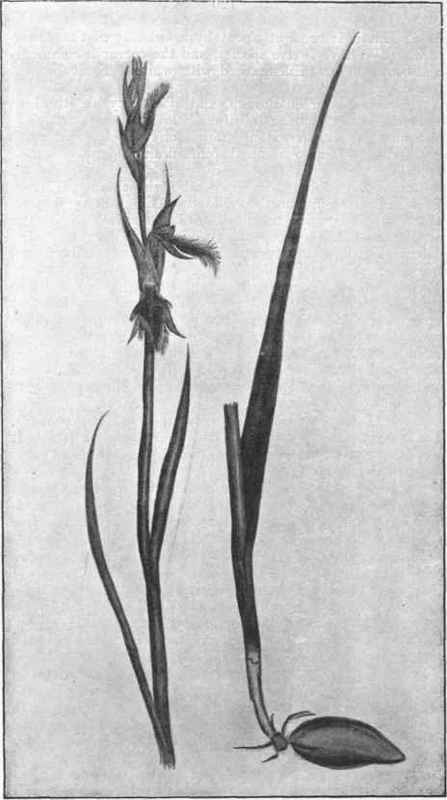 Eriochilus, which appears in late summer, is small, without any leaf, and one or two pink flowers, very like a small Caladenia, but the labellum is erect, with a fleshy sharply recurved end. 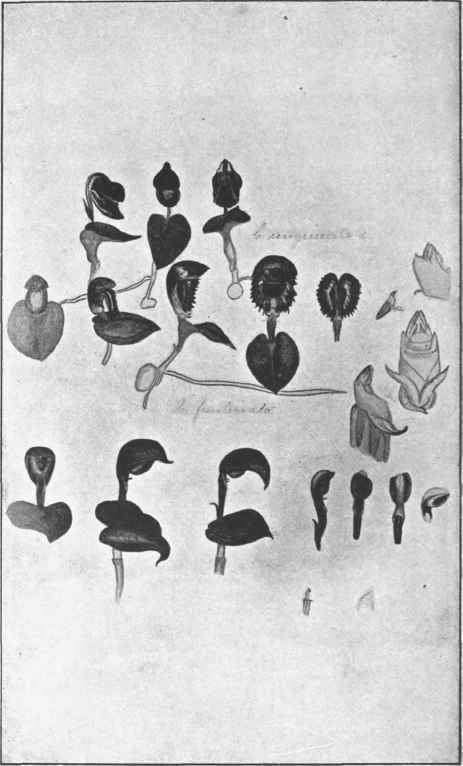 Corysanthes is only about an inch high. It has a single heart-shaped leaf and a broad hood-Like dark-red flower. Pink-spotted Orchid is a fine many-flowered plant, very like a hyacinth. It has no leaves or green tissue. It grows from a bunch of tubers, is dusky, with few or many dusky and white flowers, very constricted at the orifice.